Taiwan protested Tuesday over a Philippine plan to explore oil and gas in disputed waters in the West Philippines Sea (South China Sea) where Taipei claims sovereignty. 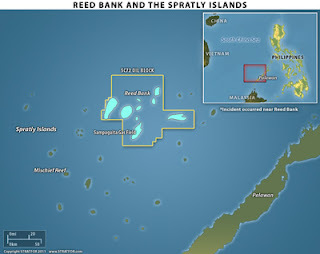 "The Reed Bank is part of the Spratly islands... and we reject any claim or occupation by any means of the islands and the surrounding waters," the foreign ministry said in a statement. 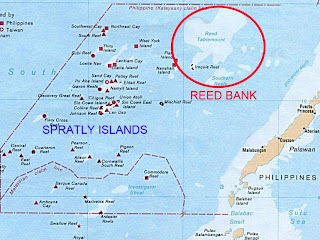 It is already pronounced by the Philippines President Aquino that Reed bank is not part of the Spratlys and must be excluded from the disputes. 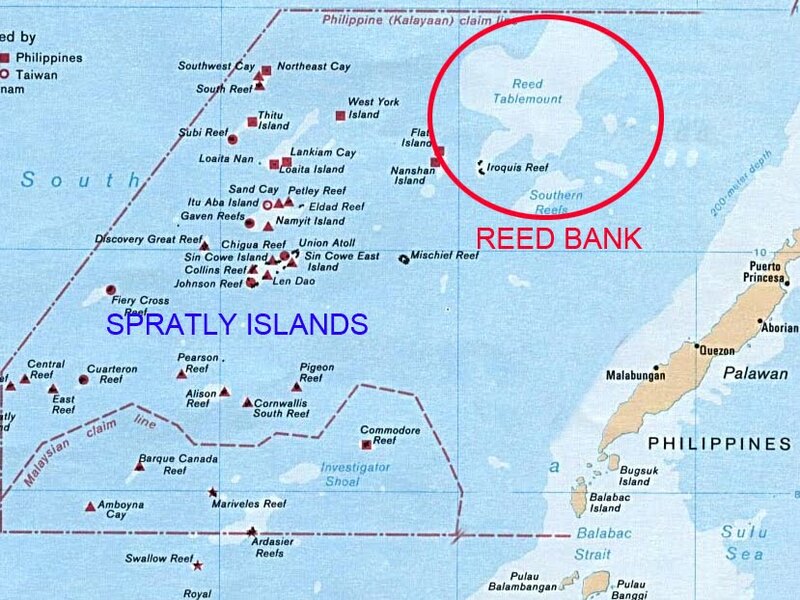 Recto Bank is 92.60 KM or 57.539 Miles distance from Palawan main Island, Province of the Philippines. 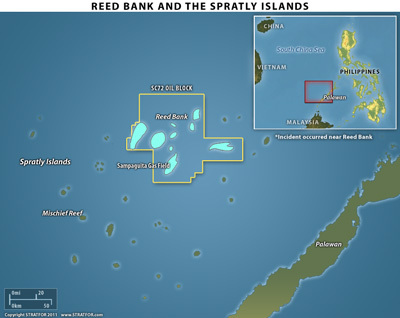 According to the ministry, the Philippines is planning to accept bidding to explore and drill for oil and gas in the Reed Bank. Taiwan, Vietnam, Brunei, China, Malaysia, and the Philippines claim all or part of the Spratlys, which could lie on top of large oil reserves. All claimants except Brunei have troops based on the archipelago of more than 100 islets, reefs and atolls, which have a total land mass of less than five square kilometers (two square miles). The Taiwanese coastguard currently has a 130-strong garrison on Taiping, the biggest island in the Spratlys archipelago. Taiwan's security chief has called for Taipei to commit more military resources in the Spratlys, reacting to reports that rival claimants to the disputed waters are building up their armed presence. Spratlys Archipelago is part of the territory of the old Sultanate State of Sulu which is currently under the Philippines government. 80% of the Whole Spratlys Archipelago is within 200 Nautical Mile exclusive economic zone of the Philippines. A SENIOR military official has recommended the crafting of a national security policy that would address the issues involving the Spratly Group of Islands and reinforce the country's claim over the disputed islands on the South China Sea. In a paper, titled "Strategy of Indirect Pressure: A National Security Strategy on the West Philippine Sea [Spratlys]," Maj. Gen. Francisco Cruz, Armed Forces deputy chief of staff for intelligence (J-2), lamented that despite the existence of the long- standing dispute among the five claimant countries and China's aggressiveness, the National Security Council has not drafted a national security strategy that would directly address the Spratlys issue. "In July 1999, four years after the discovery of Chinese structures on Mischief Reef [located within the country's exclusive economic zone], the task of formulating the strategy was delegated to the Cabinet Committee on Maritime and Oceanic Affairs (Cabcom-MOA) chaired by the secretary of foreign affairs. "Today, the government is still bereft of a coordinated strategy that would employ the country's elements of national power to assert sovereignty and protect its interest in the West Philippine Sea [Spratlys]," Cruz said. He, however, noted President Aquino's declaration of "what is ours, is ours" in relation to the country's claimed territory on the West Philippines Sea (South China Sea). CRUZ recommended four strategic actions that would counter China's aggressiveness and "gunboat diplomacy," and fortify the country's foothold on the South China Sea. These are psychological ploys, diplomatic maneuvers, intelligence support and interagency cooperation through the creation of a National Maritime Enforcement Agency that he recommended to be headed by a senior Navy officer who would have the priority in the use of military assets. In the same paper, Cruz said he believed that China will not attack other claimants just to enforce its claim, because it would be isolated by the Association of Southeast Asian Nations and will have to face two fronts: the Taiwan Strait and the Spratlys. Cruz said the country has a security policy on the disputed territory, but this was only during the time of the late former President Ferdinand Marcos. It, however, disappeared with the exit of American forces when the former Clark Air Base and the Subic Naval Base were closed. He noted that in April 1983, then- Prime Minister Cesar Virata warned all claimants that any attempt to reclaim the Kalayaan Island Group in the Spratly group would be considered as "an assault against the Republic of the Philippines and would receive appropriate response." "Such policy was reasonable at that time because of the Philippines's close security relationship with the United States, [as] greatly evidenced by the presence of the latter's military bases in the country," he said. Cruz said that in 1978, Marcos even issued Presidential Decree 1596 that officially declared the Kalayaan Island Group as part of the country's territory by reason of "history, indispensable need and effective control and occupation." In view of the policy, the Armed Forces Western Command (Wescom) was even activated in 1976 or two years earlier before the presidential decree was issued to keep the occupation of the KIG and defend existing oil explorations in the area. At present, while the country lacks a national security policy governing the Spratlys, it was anchoring its claim on four policy foundations and these are the 1982 United Nations Convention on the Law of the Sea (UNCLOS), the 1992 Manila Declaration, the 1995 RP-China Code of Conduct and 2002 Asean-China Declaration on the Conduct of Parties in the South China Sea. Under Unclos, 80 percent of the KIG and its surrounding maritime areas fall within the country's exclusive economic zone. CRUZ said the lack of a national security policy may have abetted Beijing's ongoing act of transforming the Spratlys into a "Chinese lake," noting the repeated violations of China of the country's EEZ. These are the occupation of Mischief Reef in 1995; the March 2, 2011 Reed Bank incident which is located 144 nautical miles west of Palawan; the harassment of four Filipino fishing vessels by a Chinese warship at the Quirino Atoll which is located 180 nautical miles off Palawan; the construction of a tide staff at the Amy Douglas Bank on May 29, 2011 and at Rajah Soliman Reef on June 5, 2011; the sightings of unidentified fighter jets over Amy Douglas and Investigator Shoal on May 5 and June 4, 2011, and the presence of People's Liberation Army Navy vessels near Amy Douglas on May 24, also last year. Cruz said that in the Quirino Atoll incident, the Chinese frigate even told the Filipinos over the radio: "This is Chinese warship 560. You are in the Chinese territory, leave the area immediately." Other than the absence of security policy, Beijing's intrusions into the country's territory were also negated by the lack of assets by the Western Command to ward off such violations. "The operational strategy dictates the military's Western Command to guard against foreign intrusions within the country's EEZ and protect oil exploration, through naval patrols, intelligence and aerial reconnaissance," Cruz said. But he also added, "Today, Wescom is still burdened by the inadequacy of air and sea power assets since its activation in 1976." Cruz noted that the laxity of assets puts into question the capability of the Wescom to protect the country's interest in the Spratlys and demonstrate military deterrence. He said until President Aquino's decision to modernize the military through Defense Secretary Voltaire Gazmin, the long-standing dispute has not accelerated the modernization of the Armed Forces.